From a marketing perspective, there is no such thing as “social media.” It’s nearly pointless to think of social media as one thing, because the audiences, use cases, technology, algorithms, optimal cadences and other characteristics of each social platform continue to diverge. For example, a recent study by CoSchedule found that the “optimal” number of daily posts on Twitter (your mileage may vary) is 15, but just one to two posts per day on Instagram and Facebook are the sweet spot. Posting the same social media content, in multiple channels, at the same time and hoping to achieve spectacular results is no longer a winning strategy in most cases—the variances are just too great among what works in each venue. So instead of thinking about a “social media” strategy, you really need to adopt a Twitter strategy, and a Facebook strategy, and an Instagram strategy, and a LinkedIn strategy, and beyond. This is also how television conglomerates operate. Scripps Networks owns HGTV, The Food Network, DIY Network, Great American Country, and several more. They don’t think of those channels in aggregate as “television programming.” Instead, they think of HGTV viewers, and DIY viewers, and GAC viewers because the demographic and psychographic characteristics of each viewer group differs. And more importantly, what each group WANTS from each channel varies as well. Your social media strategy should adopt the same approach. For each social platform where you are active, identify the distinct strategy, audience, metrics, cadence, and programming that makes sense for that platform. Here’s how it looks in chart form. 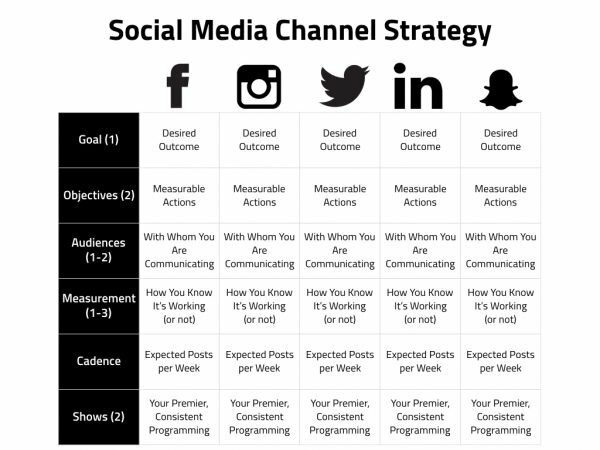 Download this Social Media Channel Strategy Template. What is the overall desired outcome of being present on this platform? One goal per platform, and these must tie to higher-level business outcomes. Two specific, measurable actions that guide the progress toward the goal. Who do you want to reach on this platform? Identify one or two specific segments, with as much detail as possible. Identify up to three metrics that either measure against the objectives, or measure something that correlates to the objectives. This is not the place for “number of followers” as a metric. How often you plan to add new content to this platform, expressed weekly. Decide what two “shows” you will commit to in this platform, and on what schedule. HGTV, or any other television network, doesn’t just randomly put an episode on the air. Everything revolves around specific shows, with a defined audience and narrative arc. Social media practitioners could learn a lot from this approach. Yet, much of what happens today in social is “random acts of content” with no repeatability, tune-in value, or consistency. For each social platform, think about what social media content initiatives you can execute on a regular basis, keeping in mind your audience and objectives for that platform. Then, create and distribute these “shows” consistently. This gives your audiences something to recognize, engage with, and (hopefully) look forward to on a regular basis. For example, my Jay Today video blog is a “show” on my Facebook page, and on my YouTube channel. I post two episodes per week. I’ve currently set it aside, but for months I was doing a “show” on Snapchat called “Baer In the Woods” twice per week. One of our clients is David Weekley Homes, America’s largest private home builder. They never had an Instagram presence, but decided to target home interior fans with a goal of making their brand the preferred private homebuilder amongst this audience. 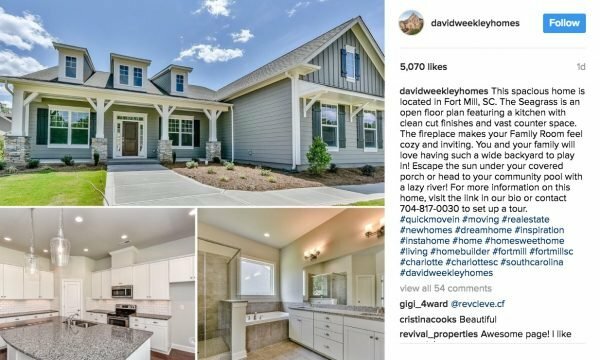 To do so, we helped them architect a daily Instagram “show” that features two or three lovely photos of a David Weekley Home model. From a cold start, they now routinely generate more than 5,000 likes per photo. More importantly, each photo gets 50+ comments—many from design pros—that help the company think through future layouts, design touches, and more. It’s a highly targeted, nearly free focus group. Not only do shows of this types create tent poles for your social media strategy, it makes it a LOT easier to plan your time and your resources, because you know what you’re doing, in what format, and how often. Your entire social media strategy is not comprised of show episodes, but they give you the nuclei for your content, and then around them you post non-show electrons that are original, circumstantial content and/or curation. Download the free social media channel strategy template here, and in the comments below or on Facebook or Twitter, let me know what TV-style shows you are committing to in the future.